Iran Sentences American To Death In Spy Case : The Two-Way The family of Amir Mirzaei Hekmati says he went to Iran to visit his grandmothers. Iran says he came to spy. The U.S. has demanded he be released. In other news, Iran claims it has started enriching uranium. 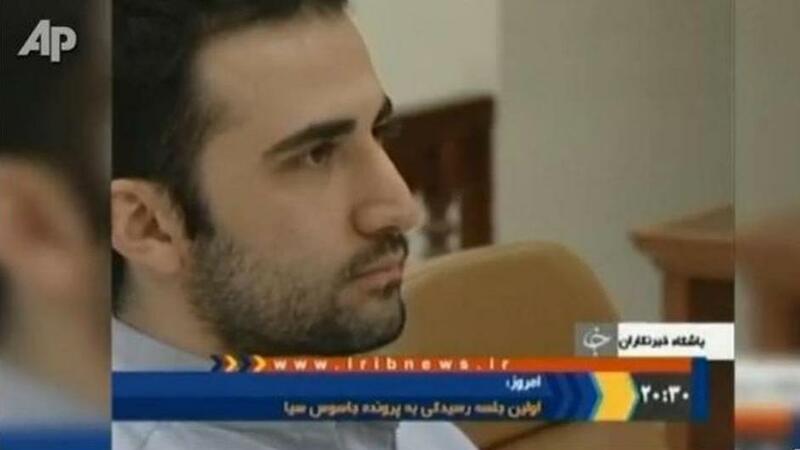 Amir Mirzaei Hekmati as seen on Iranian TV. The Associated Press reports that Hekmati was born in Arizona, graduated from high school in Michigan and was an Arabic translator while in the Marines. The wire service adds that "his family is of Iranian origin. His father, a professor at a community college in Flint, Mich., has said his son is not a CIA spy and was visiting his grandmothers in Iran when he was arrested." "On Dec. 18," the AP adds, "Iran's state TV broadcast video of Hekmati delivering a purported confession in which he said he was part of a plot to infiltrate Iran's Intelligence Ministry. ... It is not clear exactly when he was arrested. Iranian news reports have said he was detained in late August or early September." Under Iranian law, Hekmati reportedly has 20 days to appeal. As Reuters notes, Hekmati's conviction and death sentence are "likely to aggravate U.S.-Iranian tension already high because of Tehran's nuclear work. ... The U.S. government has demanded Hekmati's release, saying he has been "falsely" accused. State Department spokeswoman Victoria Nuland said last month that Iran had not permitted diplomats from the Swiss Embassy, which represents American interests in Iran, to see him before or during his trial." In related news, The Guardian says "the announcement on Monday of Hekmati's death sentence came as Keyhan, a newspaper with close connections to the conservative clerical establishment, reported that Iran has started enriching uranium at the Fordow plant, a heavily fortified site dug under a mountain near the city of Qom." There's an AP video report here. Update at 12:30 p.m. ET. Hekmati's parents are "shocked and terrified." "My husband Ali and I are shocked and terrified by the news that our son, Amir, has been sentenced to death. "We believe that this verdict is the result of a process that was neither transparent nor fair. "The Iranian authorities are denying that Amir is a United States citizen, despite the fact he was born in Flagstaff, Arizona. "Amir did not engage in any acts of spying, or 'fighting against God,' as the convicting Judge has claimed in his sentence. Amir is not a criminal. His very life is being exploited for political gain. "A grave error has been committed, and we have authorized our legal representatives to make direct contact with the Iranian authorities to find a solution to this misunderstanding. "We pray that Iran will show compassion and not murder our son, Amir, a natural born American citizen, who was visiting Iran and his relatives for the first time."